Esperanza Menendez-Jackson is a single working mother who lived with her three children in a government-subsidized apartment building in Newark, New Jersey. Early into the lease, she discovered that the apartment was infested with bed bugs and was without heat, hot water, and a working oven. The apartment’s one bathroom had a serious mold problem. She and her children wore layers of heavy clothing and on the coldest nights, sought shelter with family and friends. To avoid the spread of bed bugs, the family endured the daily ritual of shedding, bagging, and changing their clothes in the hallway each time they left home. 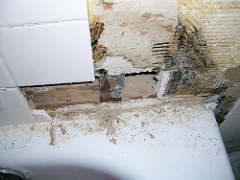 Over the course of a year, the landlord did little to address the significant problems and health hazards on site. When Menendez-Jackson finally withheld rent in an attempt to correct the problems herself, the landlord moved to evict her. Throughout the protracted court proceedings that followed, she was ordered to deposit her portion of the rent with the court to show good faith. Astonishingly, however, during those many months and thereafter, the landlord continued to receive the lion’s share of the $1,800 monthly rent payment from the NJ Department of Community Affairs. In that way, Menendez-Jackson became voiceless. Though she could continue to protest the deplorable conditions in her home and even assert those claims in court, the landlord’s principal cash flow was not at risk. For the past year, my colleague Abbott Gorin, Esq., law student David Guzik, and I have chronicled the experiences of low-income tenants like Menendez-Jackson in Essex County, New Jersey. Our study will be published this month in the Rutgers Law Review. We looked at the 40,000 residential eviction proceedings for nonpayment of rent that were brought in 2014 in Essex County and found, remarkably, that only 80 of those cases—0.2 percent of all residential eviction actions—had tenants asserting the defense that the premises they inhabited were substandard. That figure is startling, particularly given the far greater statistical likelihood that serious housing code violations exist in rental units in Newark and its vicinity. That defense to nonpayment of rent, known as breach of the implied warranty of habitability, is supposed to guarantee that residential tenants live in apartments that are livable and in good condition. It was created to give aggrieved tenants who are, for example, without heat or running water or who are suffering from rodent, bug, or mold infestation, the right to lawfully withhold rent until the landlord makes the necessary repairs. It is meant to be a defense to an eviction action. Yet in most cases that guarantee goes unheeded. We teach our law students that a right without a means for its vindication is hollow. Much more must be done by the organized bar to assure the provision of effective access to counsel for low-income tenants. Even when tenants are represented by counsel, the system is stacked against them and the larger aim of improving stocks of affordable housing. Today even the most egregiously derelict landlord is assured a steady and uninterrupted governmental cash flow in the form of substantial rent subsidies no matter the tenant's assertion in court that the premises are grossly substandard or worse, unlivable. To add insult to injury, every residential tenant named in a nonpayment of rent action faces the very real likelihood that he or she will show up on a “tenant blacklist” or central registry maintained by private agencies that is the equivalent of a miserable credit rating. Tenants placed on that list find themselves denied future renting opportunities and worse. It is time for significant statutory reform of the landlord-tenant laws. A mechanism must be established to allow coordination between housing courts, housing inspectors, and state and federal rent subsidizing agencies to stop government cash flow to derelict landlords and instead allow those sums to be applied to preserving and increasing stocks of inhabitable, affordable housing. Judges need quick computerized access to the given apartment's rental history and housing inspection reports and the means to alert government subsidizing agencies to landlord noncompliance with housing code standards. “Tenant blacklisting” must be hemmed in to at the least require reporting services to omit from their registries any court proceedings resolved in tenants' favor and include the full and accurate context for all information that they do provide. Tenants identified in reports should be also be afforded the opportunity to clear their names. This is an important moment for needed reform, as the plight of the working poor and those left out of the promise of decent housing come into sharper focus. Our study and its findings hope to be part of the solution. This essay was originally published as a feature op-ed in The Star Ledger. Professor Paula Franzese is the Peter W. Rodino Professor of Law at Seton Hall Law and an expert in property law and government ethics. She has spearheaded ethics reform initiatives on behalf of three governors, and as ethics advisor to state and local governments across the country, including Mayor Cory Booker’s administration in Newark, New Jersey. There should be a fund, through local government such as Housing Court or Minimum Housing departments or a local or national CDFI, that would be called the Tenant Escrow Repair Program (TERP). Tenants would have their rent placed in escrow and would be accessed either to refund rent monies to the tenant or to pool funds so the necessary repairs may be made to the home. TERP would be a defense against an eviction for non-payment. TERP could empower tenants and their allies to leverage the rents with other funds to make the necessary repairs. Of course, a lien action or deed restriction would have to be considered to avert landlords getting repairs and then moving to increasing rents to penalize tenants or as a means of pushing them out. Also, we need to stop looking at enforcement without resources, especially resources to make the improvements in the house. Many communities will not provide City funds for absentee owners or have underwriting conditions that hamper repairs such as using a credit score or having negative equity to provide public funds for home repairs. So while we need to advocate and build a system for more community control of housing, we will have investors providing housing so we need to ensure resources to improve housing for tenants and not on the basis of ownership designation. Back in the late 80s in Providence, RI we had a TERP-style program, we need to redesign TERP for current times. It could address many of the concerns and challenges in the post. We have a landlord here in Baltimore who sues his HCV tenants if they try to leave one of his properties, even if the lease has expired. The lawsuits are always for “damages” to the property (most of which I would consider normal wear and tear) and for seemingly random amounts of money (always between $8000 and $9000) that are just under the $10,000 threshold for small claims court. As if this isn’t bad enough, despite bringing this to the attention of several housing nonprofits and our city’s Housing Authority, nobody is willing to take on this man, and he (along with so many other horrific landlords) are allowed to thrive and prosper in our city. If I live to be 100, I will never understand or accept the unwillingness of our city’s housing orgs to work on this issue, considering the number of poor people we have in Baltimore who live in subsidized housing. New Jersey should look into the Speigel Act in New York State. If the apartment is subsidized by Social Services and there are documented health or safety violations, Social Services can withhold the rent until the violations are corrected. We are working with DSS to have this applied to uncorrected lead paint hazards. Attempted eviction is also considered a retaliatory event. As one of the co-authors of the recent Newark study on the use of the warranty of habitability by tenants to improve their living conditions; it is heartening to see comments which reveal that many still have faith in the process. In his seminal work, “Regulating Slum Markets on Behalf of the Poor,” Bruce Ackerman, Yale Law Journal 1971 Prof. Ackerman observed that the most serious drawback to code enforcement efforts is the lack of belief in its efficacy by those officials who often need to carry out prosecution of the effort. Clearly, a computer registry of violations for judges to free tenants from the full deposit requirement, or the concept of a tenant repair deposit pool as suggested by Mr. Neirinckx, shows that there are solutions out there to have tenants pursue their role as private attorneys general in bringing about violation removal. I would note that these practical solutions may, in the end, be more important than something such as the universal application of the Spiegel Act. In my own experience with New York’s Department of Housing Preservation & Development; there was always a reluctance on the part of officials of my own Department, not to mention the Department of Social Services, to abrogate subsidy payments to slumlords rather than lose available units to house homeless tenants. As Ackerman told us, resolve to address the problem is everything.